All trainings are delivered on the basis of a three-step cycle of theory evocation, practical teaching to enable realisation of its value and teaching reflection to help participants develop their own thoughts, analyses and resultant self-potential. 3-month course for in-service teachers once annually, 25 participants per course. Candidates with trainer potential have been systematically identified throughout the year during TCF’s multiple 10-day RWCT courses. Teachers receive an intensive training in a range of skills and subject areas including education psychology, subject skills (science, English, Thai), teaching methodologies, RWCT, leadership and management, civic education and IT. It is intended for these committed individuals to either go on to train other teachers across Myanmar in the skills which they have learnt or to implement the teaching methodologies when teaching themselves. This gradually helps to improve the quality of education and teachers in Myanmar; however this will not happen overnight. The pace of change in Myanmar is notably slow given history, culture and politics, and therefore TCF strategies will take time to emerge in practice on a notable scale. 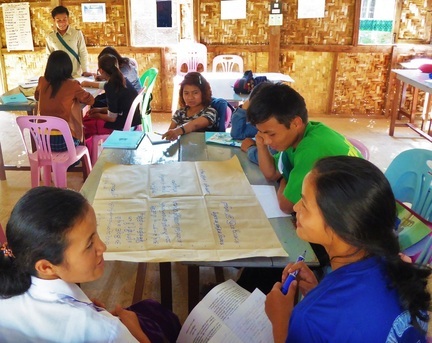 10 day courses for in-service teachers are run throughout the year for non-governmental schools throughout Myanmar with 30 participants attending each. The course provides an insight into Reading and Writing for Critical Thinking theories and practices and helps raise awareness around how to best achieve quality education in Myanmar. "I think that if teachers apply these methods, students will understand more than before"
"I think I can apply these teaching methods for students in my community. When I start applying these methods I will get advantages"
2 day Critical Thinking courses for young people working at community-based organisations are also run throughout the year, with 30 participants attending each. The workshops are provided on a needs-basis with the aim of fostering critical thinking amongst youth and active citizens as the democratic reform of education evolves. "I am very happy, I get a lot of knowledge and now I know how to think critically." I can now think and see a case or story from a different point of view."